The processing industry is going through significant changes and is affected by several industry trends. Mr. Raimo Ahola, CEO of Beamex Group says,“We have conducted extensive market- and customer-related studies worldwide during the past few years by interviewing thousands of instrumentation and calibration professionals, and based on those studies, and also on direct feedback we have received from our customers, several industry trends are evident, which pose new demands on devices and systems used for performing and managing calibrations. This feedback was the starting point for our product development project a few years ago when we decided to develop a device that will be the next measurement industry benchmark”. Instrumentation and calibration technicians are required to carry more and more measurement equipment on the field, there is demand for increasingly accurate and stable measurements due to more accurate transmitter technology and there is an increased demand for measurement equipment that automates procedures and guides the user on the field. Furthermore, plants are looking to decrease measurement equipment lifecycle costs by replacing several individual measurement devices with multifunctional devices. 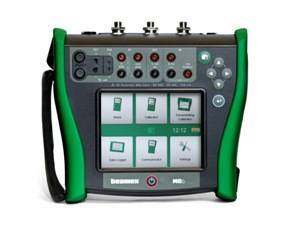 The new Beamex MC6 Advanced Field Calibrator and Communicator is a solution to the new process industry requirements. “We are extremely proud of the new MC6; it is the end-result of the largest product development project in Beamex’s nearly forty-year history”, Ahola summarizes the product development project. The MC6 is an advanced, high-accuracy field calibrator and communicator. It offers calibration capabilities for pressure, temperature and various electrical signals. The MC6 also contains a full fieldbus communicator for HART, FOUNDATION Fieldbus and Profibus PA instruments. The usability and ease-of-use are what really makes the MC6 unique. It has a large 5.7” color touch-screen with a multilingual user-interface. The robust IP65-rated dust- and water-proof casing, ergonomic design and light weight make it an ideal measurement device for field use in various industries, such as the pharmaceutical, energy, oil and gas, food and beverage, service as well as the petrochemical and chemical industries. The MC6 is one device with five different operational modes, which means that it is fast and easy to use, and you don’t have to carry equipment in the field. The operation modes include Meter, Calibrator, Documenting Calibrator, Data Logger and Fieldbus Communicator. In addition, the MC6 communicates with Beamex CMX Calibration Software, enabling fully automated and paperless calibration and documentation. The MC6 is more than a calibrator. Beamex is also introducing a new version of the CMX Calibration Software that, together with the MC6, offers new and improved possibilities for paperless calibration management. Mr. Heikki Laurila, Product Manager of Beamex Group, summarizes the features and functionality of the MC6 by saying, “The MC6 takes a unique and unoccupied position on the market, as it is a calibrator and communicator that combines advanced functionality and accuracy with usability. This is ground-breaking, because, typically products with many functions are not very easy to use”.